In 1954 the comic book industry was under attack. First came the publication of Fredrick Wertham's Seduction of the Innocent which blamed a rise in juvenile delinquency on violent comic books. Then came a congressional subcommittee hearing on the same subject which furthered both exposure and public outrage. 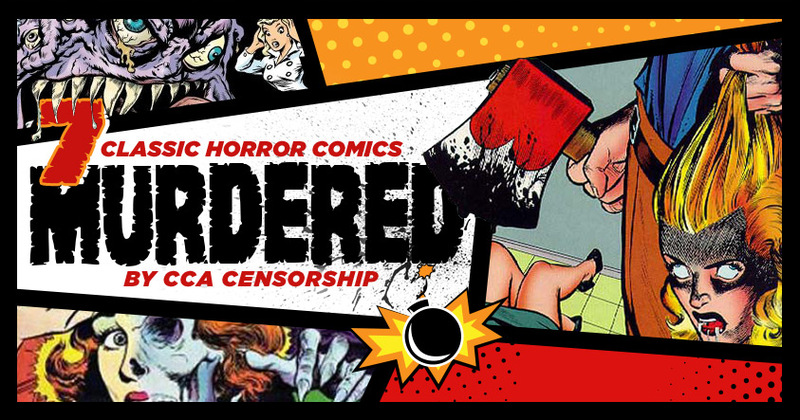 Finally a group of prominent publishers teamed up with distributors to self-censor, creating the Comics Code Authority (or CCA), which changed the face of all comics for decades to come. Although the CCA no longer exists (DC and Archie were the last to drop the seal in 2011), in many ways the industry is still recovering from its influence. The road to censorship began when interest in superheroes dropped off in the years after World War 2. Publishers started branching out into science fiction, fantasy, westerns, crime, and eventually horror. The first official standalone horror comic was Eerie #1, published in 1947. Sales were abysmal, so Avon pulled the plug until 1951, when horror comics were a full-blown trend. The best remembered horror publisher of the time was EC, which published Tales from the Crypt and others, but almost every comic book publishers had at least one horror title by the time the CCA murdered them all. Some of the titles were innocent enough, but in an unregulated field with tough competition where the biggest sales go to the person who can frighten readers the most, the violence and shock factor of certain books rose quickly. Stories on cannibalism, dismemberment, and torture were featured as often as classic monster and alien stories. There was no ratings system at the time, which led to books written for more mature readers being sold to kids indiscriminately. Although it may seem like common sense now to have different products of the same medium aimed at and sold to their respective age groups, in 1954 people didn't know what to do. So the CCA came in and banned all horror and crime stories, set up a system of rules in which crime is never depicted in a positive manner, in which the bad guys never win, and in which ghouls goblins and monsters were decidedly uninvited.